In terms of my creative pursuits, the feeling of seeing your work after months of effort is hard to top! And this full-custom suite was truly a labor of love. While it was not my first project in invitation design, this was the largest and most sumptuous suite I have done to date. I mean, look at that letterpress! Sigh. The suite included a four piece set, consisting of invitation, reply card, reception invitation and accommodation information. I love the clean, minimalistic, organic feel. The overarching mood of the suite is definitely romantic and elegant. 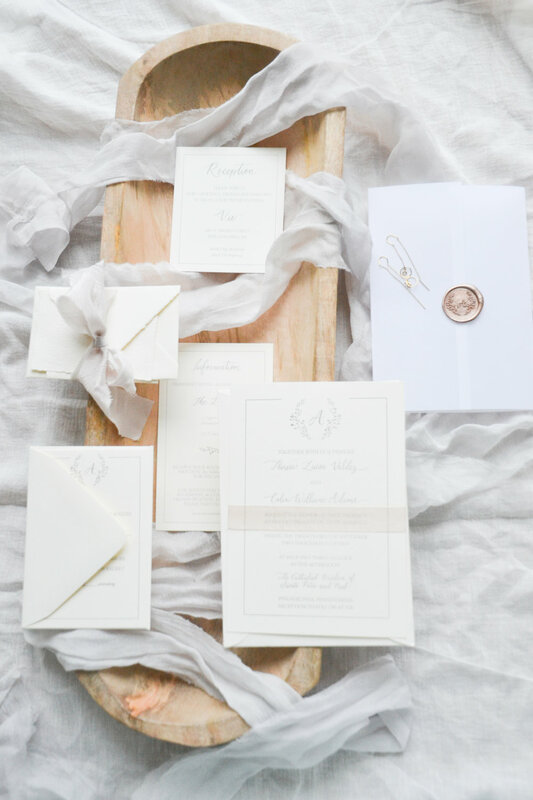 The ivory paper and grey letterpress makes me swoon! 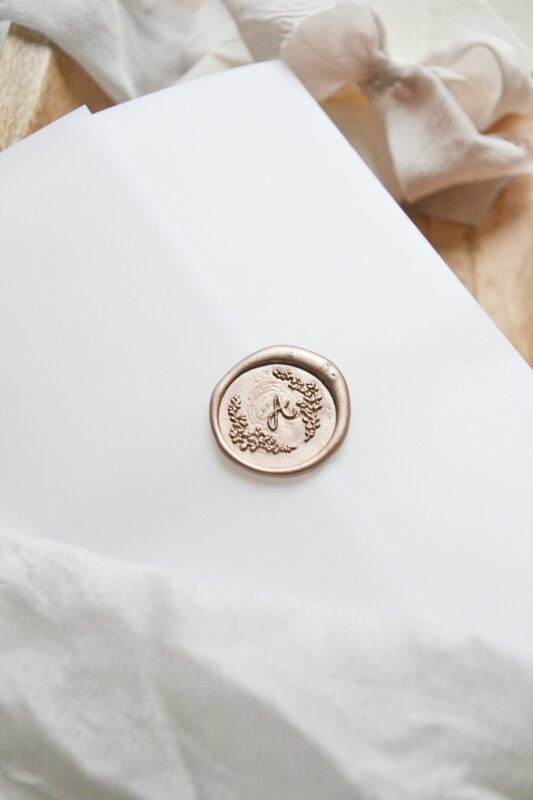 But for me, the most exciting part of the suite was the stunning wax seal that I designed! I was so (sooooooooo*) happy to see how it turned out, and it was truly the most beautiful adornment to an already stunning suite. The bride decided to go with vellum and a light pink ribbon to wrap the invitation, and I don't think she could have made a better choice! Hope you enjoy the final styling below. I think that this suite will photograph perfectly for this upcoming September wedding. One of the best parts of the suite was the intentional use of a logo to create a "branded" feel. I created a fern-inspired wreath to surround the newlyweds' initial, which was repeated on multiple cards of the suite. This logo was also used for the seal. I love this idea, as it can be reused over and over, and it creates a sense of cohesiveness and consistency for your guests. Speaking of guests, how lucky are they to receieve an invitation like this in the mail? I think I would faint.